There is something about the Middle Ages. They are exciting but quite frightening; they are attractive, but have a very ugly side. They are full of character, but not necessarily of the kind you like. The Christmas Market at Ribeauvillé has a Medieval theme, and actually captured a lot of the beauty, and some of the creepiness, of the period. Ribeauvillé itself is a town at the foot of the Vosges Mountains in the beautiful Alsace. Appropriately for a town that is famous, along with its neighbours, for its wines, the entry into town takes you past the main reason for visits to this region – line after line of vines covered the landscape, and even though they’re just twigs at this time of year, the view left quite an impression. People lining up to enter a market in Ribeauvillé, France. Some of the vines can be seen on the hill behind the houses. The town looks very German – at various points it wouldn’t surprise you if you saw Hansel and Gretel running through town. But, there is also a clear feeling of it being French. This strange Germanic-Frenchiness is basically what the whole Alsace region is about, because as a ‘borderland’, it’s had a complex history of being shunted between German and French rule. The whole messy saga started when the region, which had been ruled by the Habsburgs, was sold to France in the late 17th century. The locals were left in a strange limbo: they were ruled by a French king, but the local culture and rights of the people were kept as they were. This meant that the people still spoke German and trade was mainly with other German-speakers. It was only with the French Revolution that the area had to adopt French as their official language, and this went towards creating a new merged culture in the Alsace. Just as things were settling down, the Franco-Prussian war of the 1870s resulted in the Germans taking over the Alsace and neighbouring Lorraine regions. The end of the First World War brought these regions back into the arms of France – but the 1940 Nazi invasion brought German occupation. Since 1945, the region has been French again. But really, it’s always going to remain, more than anything else, Alsatian. Ribeauvillé has a Grand Rue (main street) lined with houses from the 15th to the 18th centuries. This is where the market is – and gosh is it picturesque. On the distant hill, visible from the Grand Rue, you can see the ruins of three castles: Saint-Ulrich, Girsberg and Haut-Ribeaupierre, which belonged to the former lords Ribeaupierre (or Rappoltstein). The lords of Ribeaupierre became the Kings or Protectors of wandering minstrels, who purchased their protection with a tax. This went on until the family died out in the 1600s, when the title of Pfeiferkönig was passed to another family, the Counts Palatine of Zweibrücken-Birkenfeld (who turned into the Kings of Bavaria in 1806). The corporation and fraternity of minstrels had an annual fair in Ribeauvillé on the 8th September for over four centuries before it was abolished by the French Revolutionaries, who got rid of all corporations. The Pfeifertag was reintroduced in 1802 as a village fair. In the 20th century, nostalgia led to the locals developing Pfifferdaj (as it’s now spelled) and now the town hosts a weekend of medieval revelry each Christmas. This medieval theme makes for a more interesting twist on your classic Christmas fare, and the town provides a perfect backdrop. There are lots of events going on, and small interludes which give you a glimpse of the medieval world – the procession of geese led through town, a creepy hairy dude who lurches at you as you’re walking along the street, another creepy dude who grabbed my coat’s fake-fur lined hood and brandished a knife. Not what I was expecting. He was obviously making a speech about stealing it, but my French wasn’t good enough to understand, and honestly, I felt a little freaked out, even though I could tell by the laughter of the crowd that he wasn’t as threatening as he seemed. I don’t know why, but it felt like a very authentic medieval experience – though in that scenario I would have lost the fur and probably my purse. Although the Grand Rue is where there are shops and some stands, little market places are set up in little open spaces just off the main thoroughfare. One was aimed more at children – where they could have a go at plate-spinning, but also try medieval-ified games that you’d get at modern fairs. Another section was filled with stands selling random items, from decorations to food and drink. It was here that we saw some minstrels. Firstly, they all looked like they’d stepped out of a medieval painting; secondly, the music was so lively and cheerful. There was a bagpipe, a little lute, a tambourine and a hurdy-gurdy. I’m not sure I’ve ever heard a hurdy-gurdy in action before, but it combined nicely with the other instruments. The guy playing the tambourine also indulged in some illusion tricks, and judging by the fact that there were other instruments lined up behind them, they were presumably going to do quite a concert. Unfortunately it was quite busy around them at that point, so we left after about ten minutes. It was really good fun. That in itself was worth going to the market for. Another section that dwelt exclusively with the medieval world was a section which looked like a little camp, with white tents housing stands and stalls. There was a fire around which people sat on logs, eating soup and drinking wine. Some ladies started dancing in a circle and got some of the visitors to join them. There is something odd about seeing people in pretty long dresses dancing alongside someone in a puffer-jacket, but it was very sweet. It was turning into a type of hokey-cokey when we left, so I’m not sure if they were going to do different types of dances for people to watch, or only simple routines for people to join in. There were craft stalls, including one where a woman had made reproduction pots and glass items. The pots were particularly good because she’d actually used different pottery techniques and based her designs on real items, including ones from France and Turkey. Towards the end of town there was another medieval zone, which is where you could see the actors shown below, along with the creepy dudes I mentioned above. Not that it traumatised me. Not at all. Anyway, food and drink was in plentiful supply here too, and the burning of cool vertical logs added to the relaxed – and warm – atmosphere. Some travelling actors putting on, what is evidently a cheery tale involving Death in Ribeauvillé, France. This is near where I almost got murdered for my fur hood. Things were also happening in one of the main squares the Grand Rue passes through. Unfortunately this was the point when it was too busy to move, so we didn’t really get to explore what was going on there. When we passed through again as we were leaving town, we stopped to watch some dancing. The neighbouring streets are also definitely worth exploring. One interesting street we walked down was called La Rue des Juifs (The Street of Jews), lined with very pretty half-timbered houses. After speculative conversations on this subject as we walked around, I subsequently discovered that there was a large Jewish community in the Alsace region as a whole, and Ribeauvillé even had a synagogue in 1311. They were mainly engaged in the cloth and cattle trade. There were various pogroms, most notably with the Black Death incident in 1349; the Jews were accused of spreading the disease (cue eye-roll), which led to their execution in 30 towns throughout the region, including Ribeauvillé. Naturally this had quite an impact on the local Jewish population, but by the end of the 18th century, there was enough of a population again to warrant the building of a new synagogue. Perhaps the strength of the town’s Jewish community is demonstrated by the fact that the first matzo baking machine was invented by the local resident Isaac Singer in 1838. However, at the beginning of the 20th century (even from before World War II) the community had dwindled to the point of being practically non-existent. The houses of Ribeauvillé are extremely pretty. There is a real variety in the construction, in that the houses have obviously been modified to suit the needs of their owners, and there is a wonderful blend of colours. I was particularly struck by the amount of rich blue buildings, and have now decided that one day I too will have a little blue house. A glimpse into a cul-de-sac in Ribeauvillé, France. The shutters have adorable heart shaped cut outs and you can just about see that there are vines carved into the left-most vertical post of the blue house. If you are a fan of the Middle Ages, I recommend visiting Ribeauvillé. I also recommend visiting if you love Christmas. And wine. And pretzels. And kugelhopf. Actually, I recommend visiting Ribeauvillé for any reason. If you get to go during December, do try and time it with the medieval goings on, but if you can’t, the town is absolutely worth visiting for its innate charm. For planning your trip, there is a tourist website, which is not massively user-friendly, but does the job of giving enough information to get going with: www.ribeauville-riquewihr.com. The medieval market is only on certain weekends, so before planning your trip, consult the web to check when it’s on. We went on the 2nd December 2017, which was its first weekend, and may explain why it was so busy. The streets of Ribeauvillé are not wide. Be aware that it can get extremely busy and that moving can be impossible. At one point in the afternoon, we were caught in a bit of a crush, which was extremely unpleasant. However, on the whole people behave very well, but it’s only right to warn you – especially for those who dislike crowds. There are backstreets to walk down, but if you want to see the main action, then the main street is the place to be, which means people. Lots of people. The vin chaud (mulled wine) was extremely good – probably because it was made by little Christmas elves. But don’t worry, there are plenty of other things to eat and drink – lots of bread, soup and kugelhof for everyone! There is also a toy shop on the Grand Rue, which had some lovely traditional style toys for sale. They also have charming decorations over the whole outside. 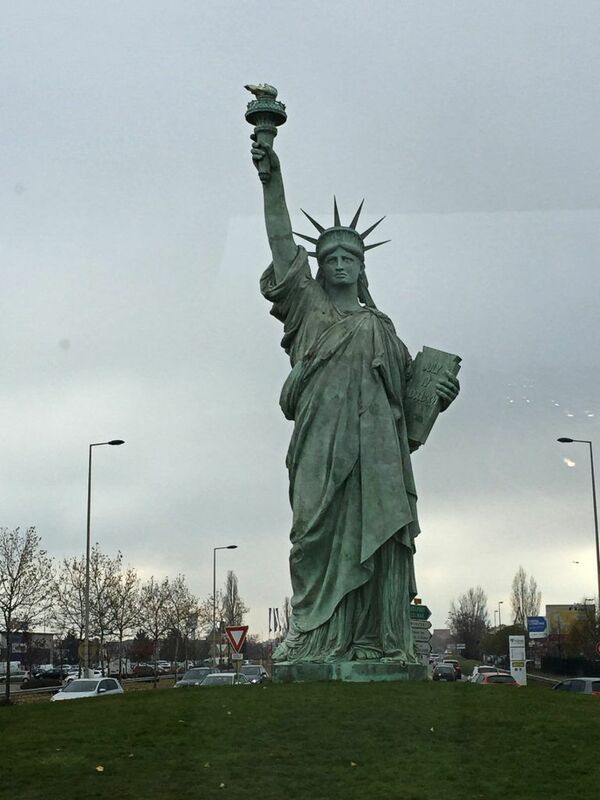 The bonus of this bus is that on the way out of Colmar, the driver very helpfully pointed out that we were coming up to a version of the Statue of Liberty, and then even more helpfully looped round the roundabout so everyone could look. It’s a 12m replica in resin which was put up to commemorate the 100th death anniversary of its sculptor Auguste Batholdi, who was born in Colmar.